so we could go Trick or Treating in the store! I am having a blast planning and executing the Do-It HERSELF Workshops at my Home Depot, I just can't believe a month has gone by already!!! Anyway, this Thursday, October 17th from 6:30 - 8pm, we will be learning Front Entrance Updates (like how to install a lock and other door accessories), then we will use that door to Trick or Treat DIH-style throughout the store to gather the materials for a fun and easy art project to decorate your front door for the fall holiday season. I thought this would be a great way to get to know the store and have a little fun in the process. I mean, why should the kids have all the fun this Halloween?!? In order to prepare enough art materials and food & beverage for everyone, please RSVP here (*making sure to sign up for the Seminole store for mine, otherwise you can attend your local Home Depot, although not every store is doing what I am doing...OK, most aren't.) We will also have giveaways, treats, and plenty of time for you to ask our experts about any of your current home improvement projects. Remember, this is YOUR workshop - it is absolutely FREE - so please join in on the fun! A FREE, FUN & FABULOUS Way to Home Improvement! ghosts & Frankensteins out of 4x4s, all for FREE! 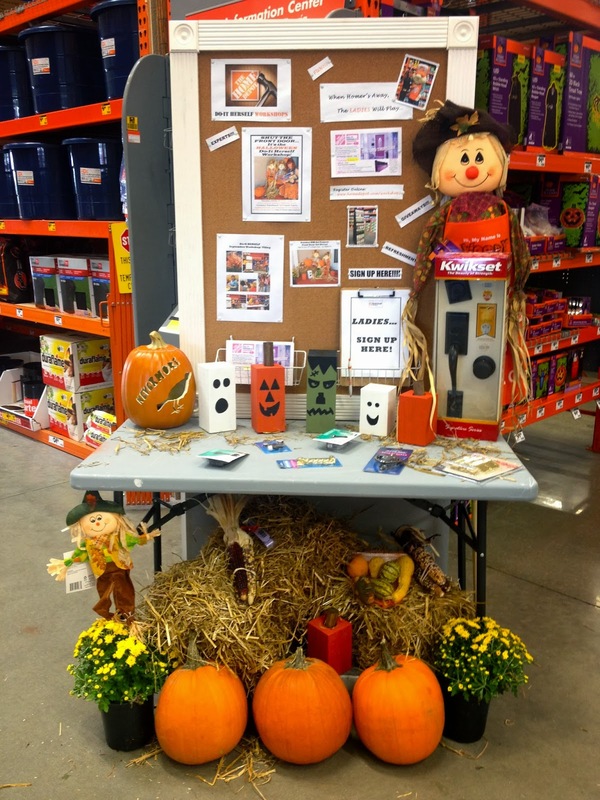 My DIH Workshop display at the store. I can't believe it has been a year since I decided to honor Edgar Allan Poe with a rock n' roll tribute by mashing up his Raven poem with "Hard to Handle" by The Black Crowes (to see blog post, click here.) I have performed it numerous times over the past year and it remains my favorite of all of my literary parody songs. 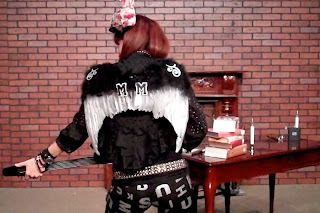 When I look back, I can't believe how far I have come not only as a performer but also as a designer/stylist. 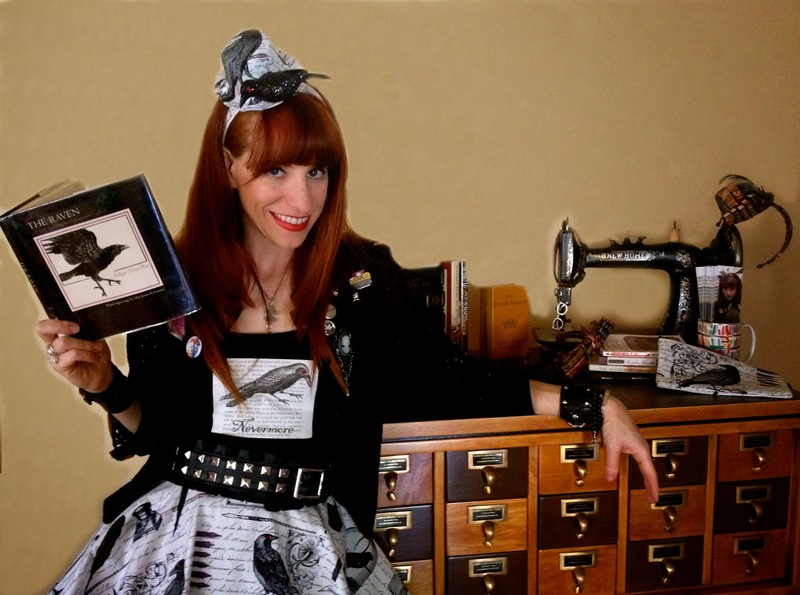 I now have an Edgar Allan Poe/Raven print fabric that I have made into an entirely new Raven outfit that far surpasses the one I wore in the video. 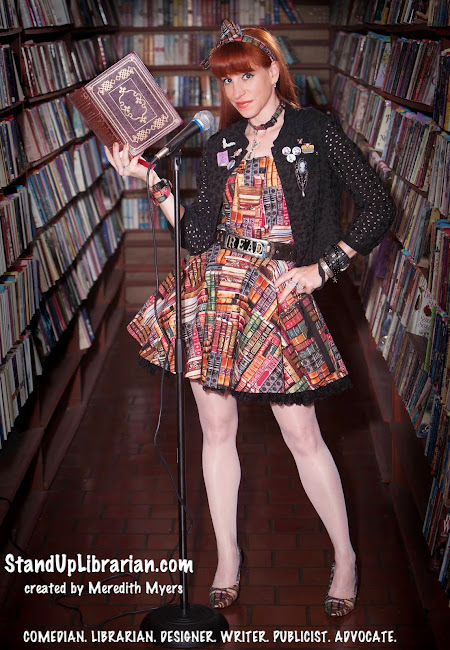 I still wear the original wings and play my styled-up librarian purse guitar, but there is something really exciting about wearing an entire outfit that I made myself. 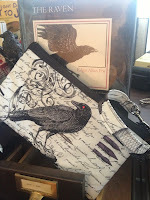 I am also so thrilled that people have fallen in love with my Poe/Raven line of wristlet purses and cosmetic bags. Just the other week, I had a customer request the Raven print in the larger style purse with the bamboo handles and it looks even more incredible! So for a limited time, I will offer that purse for sale as well. As I spend less time on stage performing and more time writing my book that I am determined to finish by the end of the year, I am reminded of how some of us really do get better with age and experience, while others allow failures or heartbreaks to stump their growth. Perhaps I am focused on age right now because I am approaching a certain number in a couple of weeks that I just don't believe - even when I look at my birth certificate! I am far too young in my heart to be that old! When I look in the mirror or at my life on the pages that I write, I am so happy that I have been able to overcome the failures and mistakes I have made with courage and bravery, not fear and anger. While some women see wrinkles, I see battle scars. I am a survivor, if nothing else. Thanks to the tragically sad, real life story of Edgar Allan Poe, who died in 1849, alone at the age 40, penniless, talented beyond belief, and perhaps as a result of alcoholism and drug abuse, I now choose to live my life completely sober without striving for money, fame, or the applause of my peers. Instead I just choose to LIVE. One day at a time. To the fullest. Wherever that journey takes me. Nevermore, will I regret that I am not more than what I am at this very moment. I am enough because I am still here, moving forward, taking hits as they come, and that is what matters most to me. As I honor Mr. Poe today, I hope he is finally at peace, leaving the demons he once fought on those fabulous poetic pages.